Reglan is a brand name of the generic medication metoclopmaride. It is used in adults for between 4 and 12 weeks to relieve heart burn symptoms. It is not recommended for children or other special populations that may have adverse reactions due to previous medical conditions. 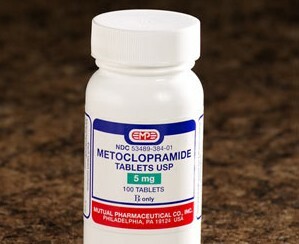 The usual dosage is 10-15 mg up to four times a day, and it should be taken 30 minutes before a meal and at bedtime. Older patients may need a smaller dose at 5 mg.
Reglan is used to treat certain conditions of the intestines or stomach, and it can also be used as a short-term treatment of heartburn if typical medications are not working well enough. This treatment of persistent heart burn can decrease damage created by stomach acid to the esophagus, and it can also promote healing. Reglan is also used to treat problems related to stomach emptying in diabetic patients, and this can decrease symptoms of gastroparesis like vomiting, nausea, and stomach fullness. Famotidine, which also has been marketed the brand names - Pepcid and Pepcidine, works to inhibit the production of stomach acid. The medication Dexilant is a name brand version of the drug dexlansoprazole; these drugs are members of the drug group proton pump inhibitors. Prevacid (lansoprazole) is a proton pump inhibitor (PPI) that decreases stomach acid and effectively blocks the sites where acid is produced in the stomach. Zantac, also known by the generic name ranitidine, is an H2 blocker that is available both by prescription and over the counter.